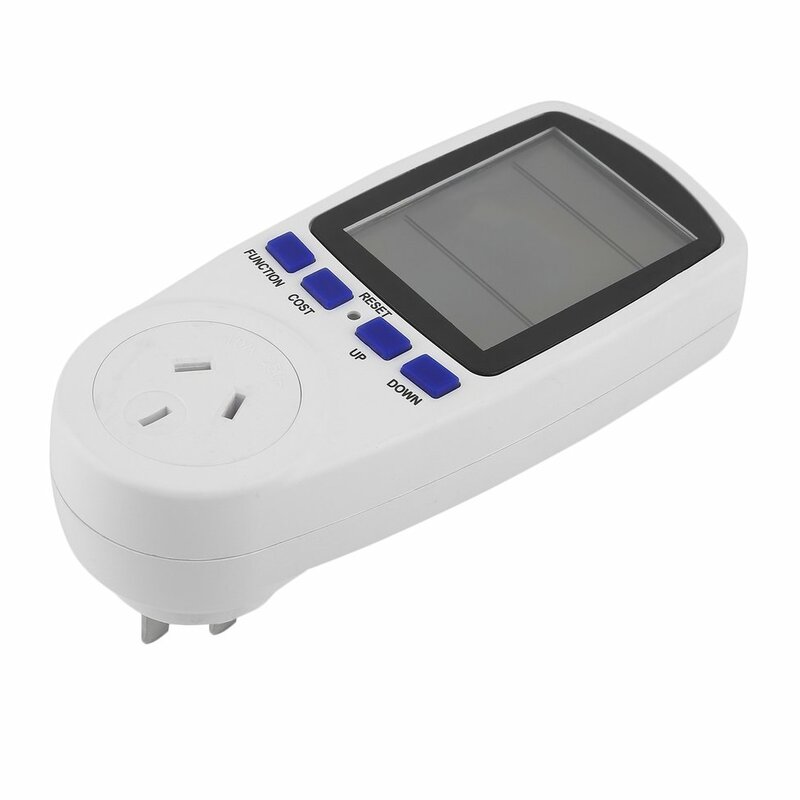 The Power Meter is a handy energy saving tool that delivers 230V-250V, 10A max Energy that is easy to setup and use. It's designed for the energy conscious individual who values savings and efficiency. The Power Meter is an affordable programmable tool that can save electricity to make you more proactive in saving valuable resources. The large and clear LCD display shows volts, amps and wattage accurately. 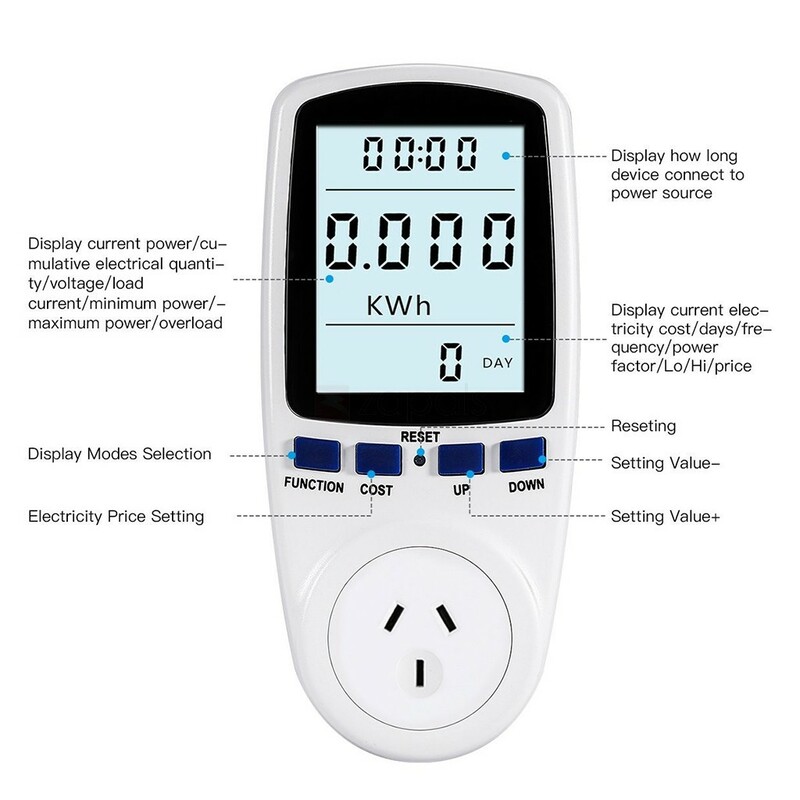 Easy to operate function buttons allow easy scrolling through various screen readings that include KW consumption in real time, as well as HI and LO values, total KWh, supply voltage and frequency. It's a great tool for monitoring individual household appliances to determine consumption cost just by operating them. The Power Meter's heavy-duty and compact body ensures durability, even with continuous use. It is also US/EU/AU/UK plug compliant so it works anywhere around the globe. For monitoring and testing instrument and household appliances. Determines the cost of electricity consumed. 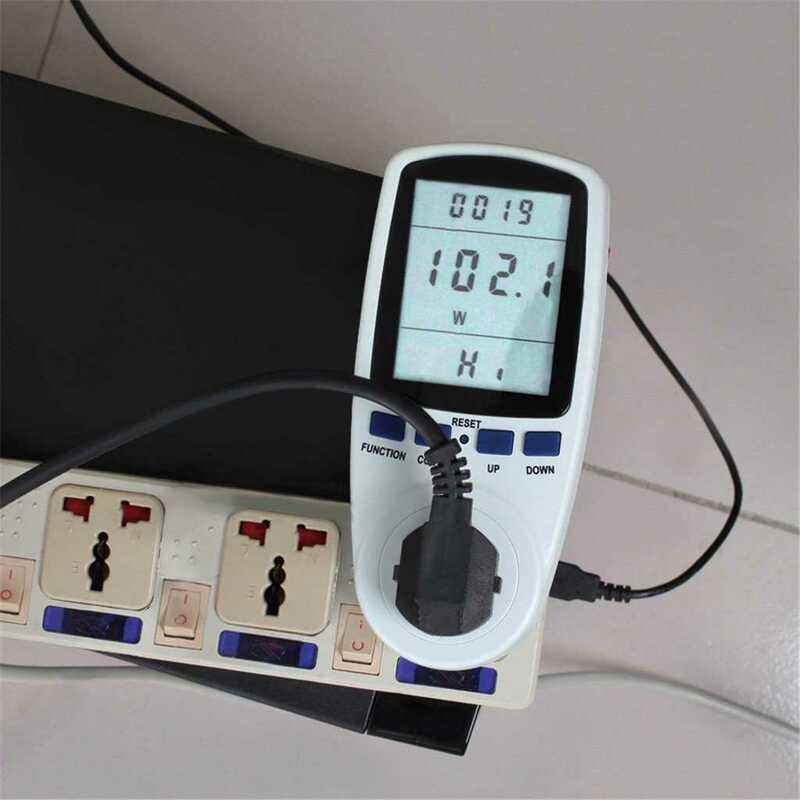 Use the Power Meter to find out the power consumption of the following electrical appliances such as: computers, television, HIFI systems, printers and scanners, among others. For the cost-saving person, the power meter works seamlessly to show your power consumption in real time. 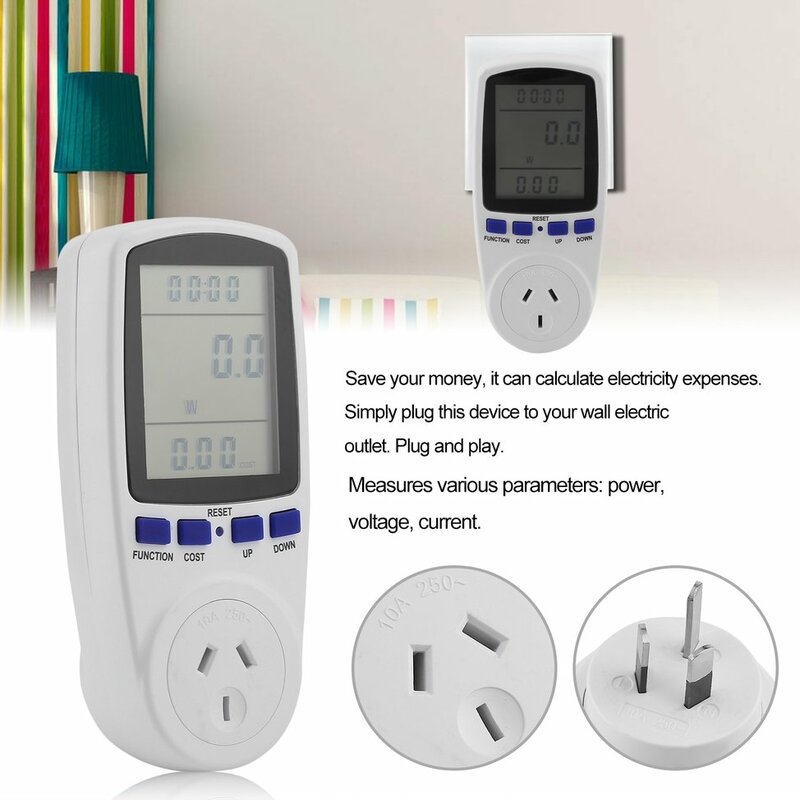 Keeping a tab on your electrical expenses is so simple using this amazing electrical gadget. All energy-efficient homes need the Power Meter. To conserve energy and resources, this gadget is a must-have. 1. Plug the power meter into the main electrical socket. 2. Plug the appliance you wish to monitor into the front socket of the power meter. 3. Switch the main socket power switch to "ON". 4. Use the appliance as you normally would. The Power Meter will now measure the energy used by the appliance. 1. Press and hold the “CLOCK” button for 3 seconds. 2. With the hour digit flashing, press “UP” repeatedly until the correct hour is reached; Time is always displayed using the 24 hour clock, so 2:00pm must be entered 14:00 for correct operation. 3. Press the “SET” button to accept the hour selection. 4. With the minute digits flashing, press “UP” repeatedly until the correct hour is reached. 5. Press the “SET” button to accept the minute selection. 6. Wait 10 seconds, or press the “OK” button to finish setting the time. 1. Press the COST button for 3 seconds to enter cost mode. 2. There are 4 currencies that you can choose to have your charges display as: (money symbol); £ (pound); $ (dollar) or € (euro). Press the UP button to cycle through the symbols and press OK to confirm your selection. 3. The Power Meter features a dual tariff system, that is, you can have 2 different tariff rates for 2 periods of the day. This is useful if you have a peak and off-peak energy billing system. 4. Press the UP button to choose between a single tariff (Tariff 1 will be displayed on the LCD) or dual tariff (DUAL TARIFF will be displayed onthe LCD). Press OK to confirm your selection. If you choose a single tariff you will only be asked to enter 1 rate. the rate, press the COST button to save your settings. between the two by pressing the SET button. 5. Set the rate using the UP button in the range of 0.00 – 9999COST/KWH. for hours (range 0-23), the second 2 digits are for minutes (range 0-59). the details for Tariff 2 using the same steps as above. Q: Can I know how much in dollars a device (e.g. fridge) is using? A. Yes, you can. Just set the tariff (cost per KWH) as indicated above. Q: How can I reset the power meter reading?? A. Using a paperclip or a pencil, press down the Reset button and hold it for around three seconds to reset. 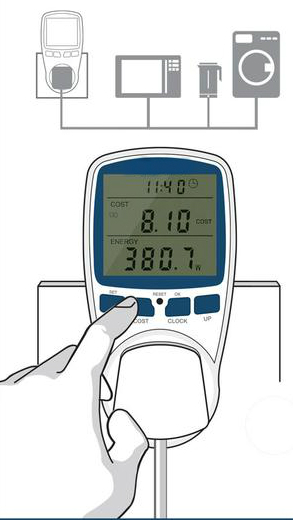 Q: Why is my Power Meter isn’t counting the energy usage? A. The Power Meter will not start counting energy usage unless the plugged in device is using more than 2W of energy. Q: Can I use the power meter to monitor many devices? A.Yes. You can do so by connecting the Power meter to a power strip.